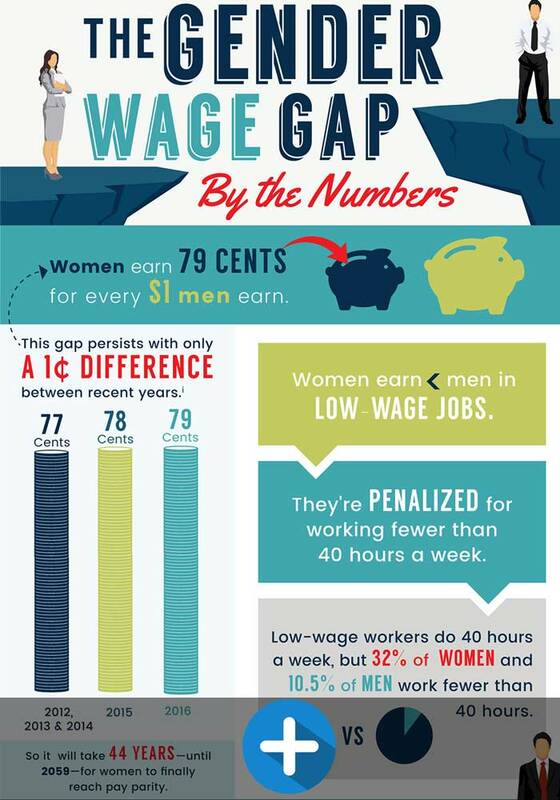 What if we told you women earn 21 cents less on the dollar than men do? Like it or not, that’s the reality for full-time workers, according to census data of median salaries. In the last four years, this gender wage gap did decrease—but it was by 2 centsi, so at this rate it will take until 2059 for women to earn the same as men. And this is despite the fact that women make up almost 50% of the workforce; are equal or the main breadwinners in 4 of 10 families; and earn more college and graduate degrees than men! Let’s explore more about how this one-sided pay gap affects working women. So how does the gender pay gap work? For starters, women employed in lower-wages jobs earn less than men—and may be penalized for working fewer than 40 hours a week. Yes, really. Occupational segregation accounts for 50% of the gap—where women work in lower paid jobs like nurses, social workers, and administrative assistants, while men typically work in higher paying jobs like CEOs, architects, and surgeons. The sad news is that even if more women worked in higher-paying jobs, the pay gap would only decrease by 30-35% for college graduates and by 15% for everyone else. And, one year after graduation, women still earn 6.6% less than men. What about women with graduates degrees? Unfortunately, women with MBAs earn an average of $4,600 less in their first jobs than their male counterparts. That’s right, the pay gap doesn’t just affect how much women make. That’s because women are also less likely than men to have access to paid time off (so they’re more likely to take leave without pay), employer-provided health insurance, and retirement savings plans.iii This is an additional burden that isn’t always recognized by the general public. But it’s felt, nonetheless. Men are more likely to major in fields that typically lead to higher paying jobs (like engineering and computer science). Women are more likely to major in field that generally lead to lower-paying jobs (like social sciences and education). Jobs that employ more men typically pay more than those that employ more women. Women are less likely to work in higher-paying sectors of the economy (but when they do they still tend to earn less). When working 40 hours per week, women reported earning 84% of what men did. The AAUW reported that the number of claims filed with the Equal Employment Opportunity Commissions—and the millions paid yearly in lawsuit settlements—show that gender discrimination and bias are still going strong in the US workplace. In fact, 40% of women who abandoned careers in a science-related field cite a “macho” culture as the main reason for doing so. The problem is that it’s difficult to concretely measure gender discrimination, particularly because people are not always aware that they are a part of the problem. Did you know that having salary transparency in the workplace raises wages? It makes sense when you think about it. That’s because, it’s hard to know whether your wage is fair if you don’t know what co-workers in similar roles are making. And unfortunately, some employers do take advantage of a lack of salary transparency. In fact, the Institute for Women’s Policy Research (IWPR) found that 51% of women and 47% of men feel that discussing wage is discouraged, prohibited, and or could result in being disciplined by employers. That doesn’t exactly instill confidence does it? It’s also no secret that men and women negotiate differently. Only 12.5 percent of women asked for more money after receiving job offers, versus more than half of men. And those women who did ask for an increase, requested 30% less than men. To make matters worse, women lose salary potential because job offers are usually based on previous salaries, which are already low. Women in middle-income roles who fail to bargain can lose as much as $750,000—and those in high-income jobs can lose 2 million—over their careers. That’s pretty huge. Why are so many women hesitant to negotiate? It’s likely because they are aware that while men are rewarded for negotiating, women are often penalized for doing the same. In other words, they know that gender bias plays a role. The first step is to have both men and women recognize that the gender pay gap is a problem. So by reading this you’re already on your way! Although it’s difficult for women to avoid the pay gap entirely, it’s key to be aware of the potential salaries associated with college majors and different occupations (although as we mentioned that won’t necessarily equal the playing field). Seeking out jobs with strong unions; negotiating salary offers; putting pressure on employers to be transparent with pay; and advocating the federal government to strengthen equal pay laws are all actions that women can take to help close the gap. But, clearly, it’s not going to happen overnight. It’s also important to have conversations with your friends, family, and co-workers to help ensure that they are aware of the realities of this problem. The more that people know, the more likely that they will be a part of the effort to create change. And don’t forget, Equal Pay Day is April 12!